Whenever I’m having a hankering for chicken nuggets, I whip up a batch of these zero guilt Baked Cauliflower Bites instead! Barbecue sauce is my usual dip of choice, but I have also had them with homemade honey mustard dip, ranch, Frank’s Red Hot Sauce, and even ketchup. All of which were tremendously delicious. And with each serving being just 2 Points (not including the sauce), these are a WAAAAAAYYY better choice than chicken nuggets! Because, let’s face it, the nuggets are really only the vehicle for the dipping sauce, so why spend a lot of those Precious Weight Watchers Points on a fast food chicken nugget that’s loaded with terrible ingredients? Baked Cauliflower Bites are the way to go – they are super healthy and are so low in calories that I can go to town with my dipping sauce. 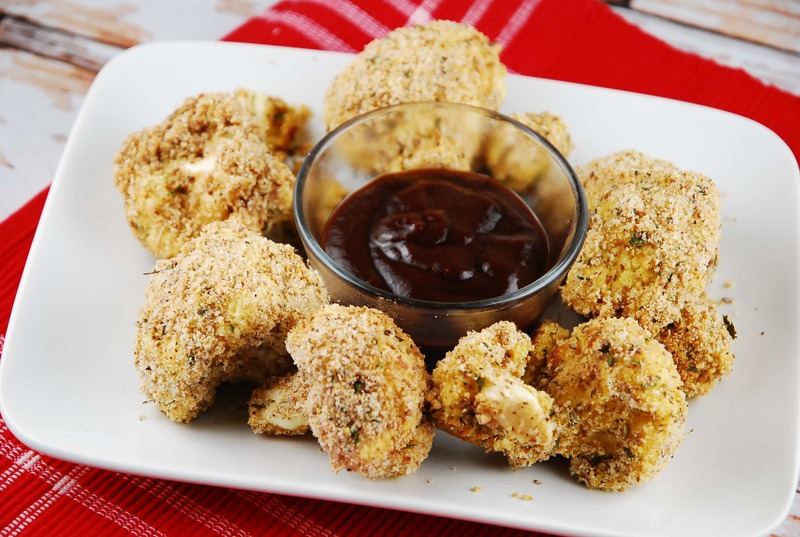 A healthier, vegetarian version of chicken nuggets, these cauliflower bites are delicious and super healthy. They offer a great way to satisfy cravings for fast food nuggets. Preheat oven to 400 degrees and line a rimmed baking sheet with foil or parchment paper. Mist with an okie oil mister to non-fat cooking spray. Combine Panko, garlic powder, onion powder, parsley, salt and pepper in a small, bowl. Place egg whites in a separate small bowl. Dip each piece of cauliflower into the egg whites, shake off excess, and then dip into Panko mixture coating evenly. Place onto baking sheet and mist lightly with an olive oil mister. Place in oven and bake until cauliflower is tender and breading begins to turn golden brown, about 25-30 minutes. Tried these tonight. So good! I don’t know that I would suggest them as a substitute for chicken nuggets, but as a really tasty, fun side dish – it’s a winner. I used a couple tablespoons of flour before the egg coating because the panko coating wasn’t sticking. I also ended up with about a third of the coating left over. We had them with a little bbq and cocktail sauce. This one definitely earned a spot in our cooking rotation. Thanks!